The Red Master T-Rex was designed for any type of arena, including personal or multi-purpose. We designed this harrow from the suggestions of our customers who wanted a true all-in-one harrow. With the versatility and adjustments built in this harrow, you will never need another arena tool. The Red Master T-Rex was designed for any type of arena; personal or multi purpose. 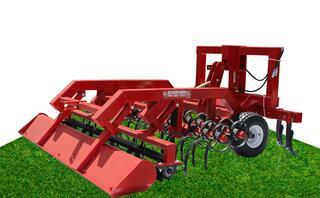 We designed this harrow from the suggestions of our customers who wanted a true all-in-one harrow. With the versatility and adjustments built in this harrow you will never need another arena tool. Our ripper attachment has set us apart and made Red Master the industry leader. Our top link that attaches the ripper to the harrow allows for adjustments on making the ripper as aggressive or nonaggressive as you need. This will allow the harrow to remain level and continue to work the ground behind the ripper. Other arena tools have a fixed ripper. To change the angle of the ripper you have to tilt the complete unit. This will then change the entire unit behind the ripper. The gauge wheels are designed to ride along the surface to maintain a level cutting surface and allow you to put anyone on the tractor and still achieve consistent depth. Once the harrow is setup correctly you drop your three point all the way down allowing your tires to be your depth control. You no longer have to be an expert in using the hydraulics. Our two rows of offset s-tines controlled by a traditional top link can be set 1 to 8 inches in depth. The s-tines are used to help loosen up clods and to fluff the ground adding air to the soil. This will aide in the cush feel that we strive to achieve for a riding surface. Our paddle wheel located at the rear of our unit serves two purposes. The first and obvious is clod busting. The second is to help add more air into the ground. Our paddle wheel is built like a paddle wheel on a boat. This actually will stir the ground. Our paddle wheel is also designed to float. The floating action allows clods to roll under as opposed to locking up and dragging dirt. Also many units on the market have their rolling baskets or rakes fixed and will not float. When you are turning and the tractor or harrow may want to drop. If this is fixed it will want to move more dirt to the side and develop holes in your arena. With the floating action this will not happen. Our float pan is to ultimately smooth the ground and lock air into the ground, providing a finished look and a ‘cush’ that would simulate air-ride for your horse. All prices are FOB our warehouse. Please call 866-362-9353 for more information or for a dealer near you.